While I sometimes complain about the lack of variety of birds in New Zealand, there are at least some birds here that are a) hard to find but b) can be found in many places. 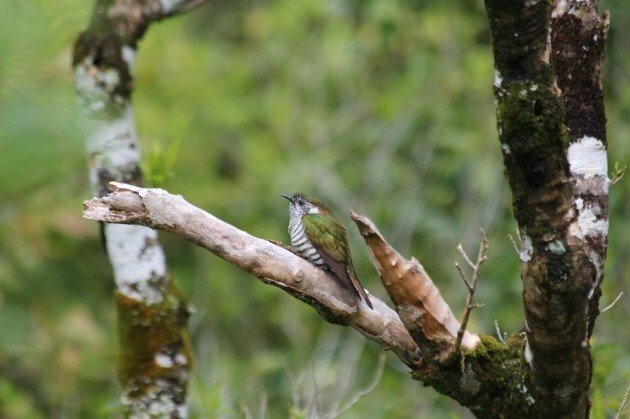 Most rare birds here are only found in specialised places, but you can always rely on our cuckoos to be potentially anywhere, even if your actual chances of seeing one are vanishingly small. It’s a foolish idea to go out and actually try and find them, better to just be ready to possibly see them at any time, while knowing you probably won’t. That said, it was just such a silly impulse that took me last weekend. You see, I follow a a cuckoo researcher on Twitter (and you should too) who mentioned that one of New Zealand’s hardest birds, the Long-tailed Cuckoo, had been heard in the suburb of Karori last Thursday, and I reckoned that it had to be worth a look in the adjoining sanctuary, since the sanctuary was one of the few places around here that its host species bred in. I didn’t imagine I’d see one (that has happened to me certainly once and possibly twice before), but they have distinctive calls like asthmatic cicadas which if they were around I should at least be able to hear. Besides, it was a nice day and I could do with a walk. And it was a nice day, but I didn’t hear any Long-tailed Cuckoos. I did hear some Shining Bronze-cuckoos, but that wasn’t particularly surprising. 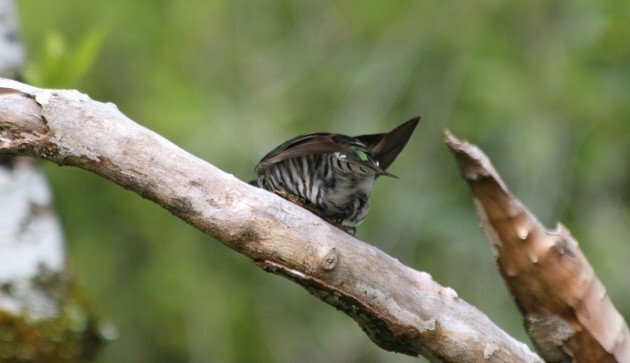 You may never see them, but they are always around and calling in the maddening way cuckoos often do. It has the repetitive single note call that birders familiar with Africa would associate with a tinkerbird. It’s easy to locate them to a tree in many cases, but after that you may as well be looking for the Lost Treasure of the Sierra Madre. 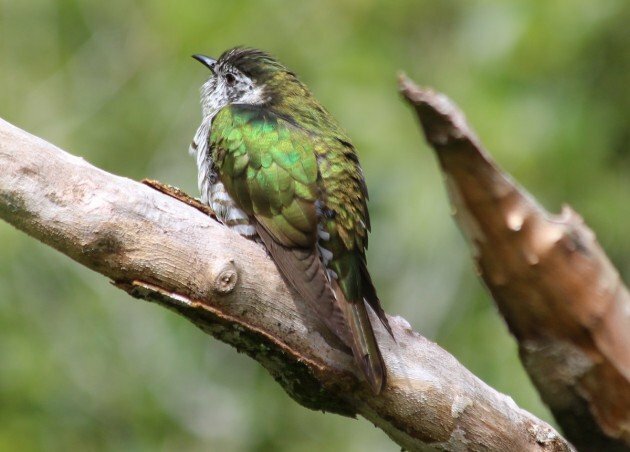 Nearly 8 years in New Zealand and I have seen them as often as I have the long-tails, and they are much much more common and found around areas that I walk every day. I can only imagine guides showing visitors around hate them. I went back to the sanctuary on Sunday, in spite of early rain, figuring it couldn’t hurt to try again. I had barely made it far into the place, and was about to start photographing some breeding Australian Pied Shags when I heard a call to my left that I didn’t immediately recognise. 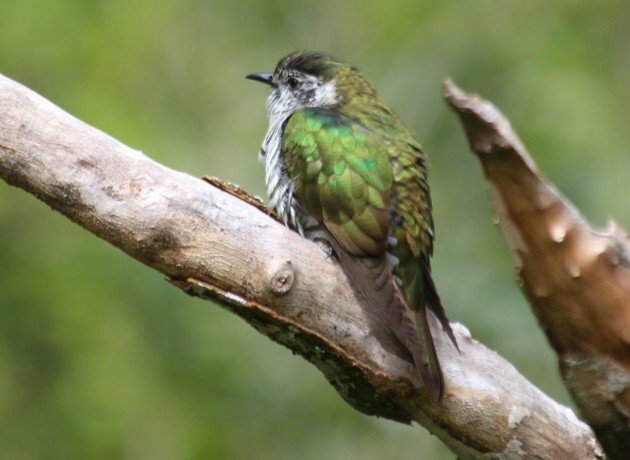 In New Zealand that’s kind of a big deal for me, and there, sitting on a dead branch in plain view, was a damn Shining Bronze-cuckoo. A cuckoo! In the open! With my camera! In plain view. Which actually, is hardly surprising, based on my tiny sample size. I’ve either seen them really easily, because they are out in the open and showing really well, or I don’t see them at all. There are simply no middle gears for this species. It’s looking at me and not flying off! And it sat there for ages, giving a single note call every now and then. It sat there so long I was able to flag down some passers by to show it to them, who had never seen one before. It was extraordinarily cooperative. I managed to get a bunch of photos, as you can see. I’ve been told its one of the hardest species to photograph here, so I am quite proud! 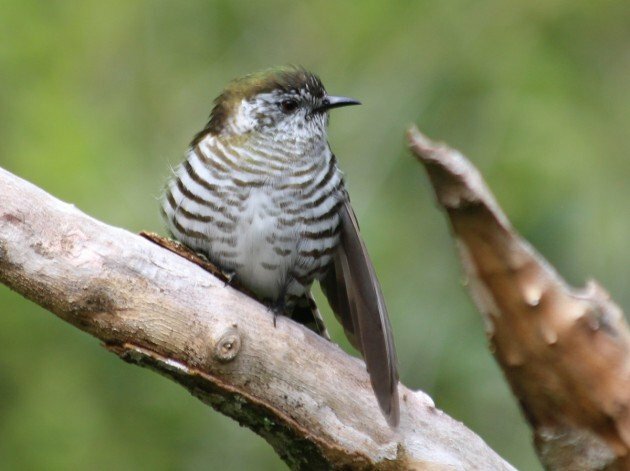 It flew after a while, but I re-sighted it with partner, as well as a Grey Warbler, the small thornbill that is its host in New Zealand (itself no slouch in the monotonous call stakes). I can’t help wondering if the conspicuousness of the bird I saw was an attempt to draw attention to itself to distract the Grey Warbler while the other laid her eggs. Other cuckoos do use distraction in this way, but I don’t know in this case. Facing me with a wing stretch. Note the contrasting stripey belly. 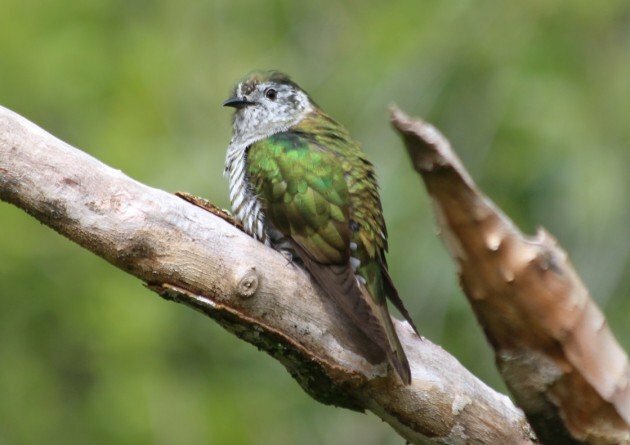 Shining Bronze-cuckoos are, along with the Long-tailed Cuckoos, the only migrant landbirds of New Zealand. 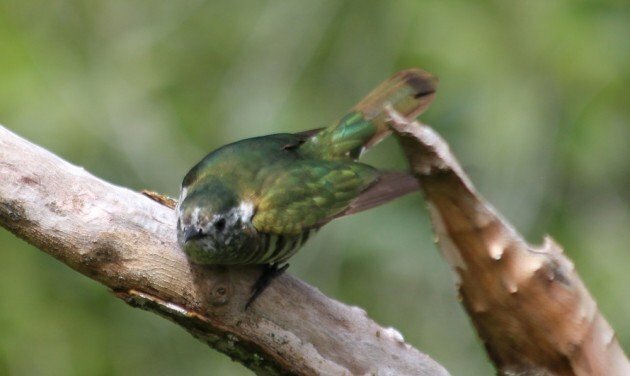 While Australian birds migrate to New Guinea, New Zealand birds migrate to the Bismark Archipelago and the Solomon Islands (there are also resident populations in New Caledonia and Vanuatu). This makes them rather special birds here, and I can’t believe what a privileged look I got of this individual last weekend. And given last weekend’s luck, I may have another go at the Long-tailed this weekend. Now that’s a friendly bird! 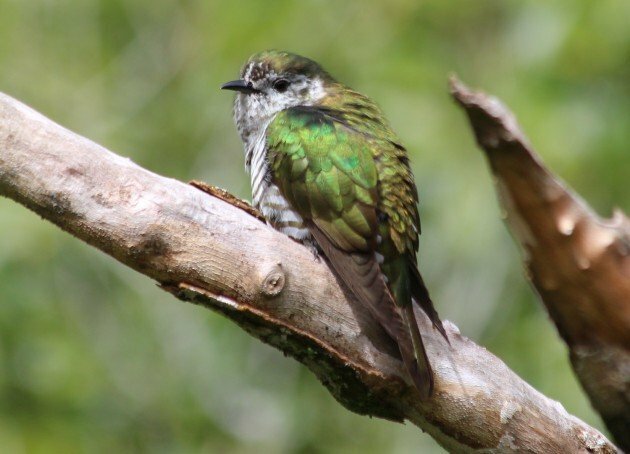 I would love to see one of those green cuckoo species.